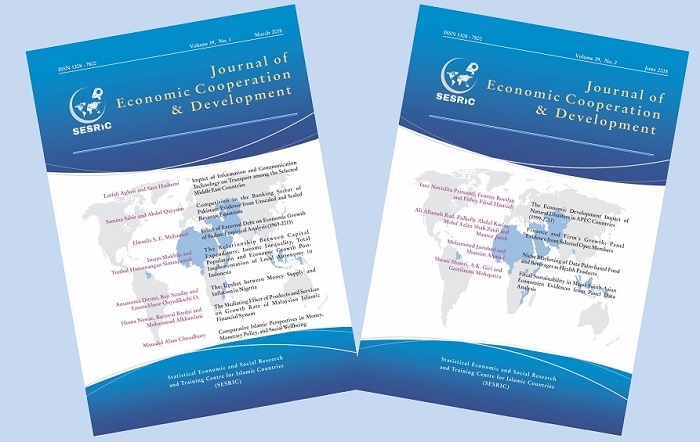 By opening a window to various scholars, researchers and academics within and outside the OIC region, the Journal of Economic Cooperation and Development (JECD) helps them to continue demonstrating an increased interest in sharing their valuable works and studies with the readers of our Journal. It also continues to serve the academic world with its noteworthy articles. As the number of submissions continues to increase each day, the Journal of Economic Cooperation and Development-team (JECD-Team) continues to encourage scholars, researchers and academics form all over the world to either submit their works or benefit from the published articles in the JECD. These articles are selected by highly qualified referees and editors who work as academics and fellows in well-known international universities. Their contribution to the Journal literarily helps increase the quality of work and widen the scope of speeding up the process of welcoming more papers from scholars in the OIC countries as well as academicians worldwide. The previous issue of the Journal of Economic Cooperation and Development – March 2018, included seven main articles on the following themes: Dealing with how the modern transport systems manage traffic, travel scheduling and passenger reservation efficiently and examining the effects of ICT on growth of transport value added among the selected Middle-East countries. Analyzing the competition in the banking sector in Pakistan during the period 1995-2014 and revealing that the commercial banks in Pakistan generate revenues in the environment of monopolistic competition and this reflects the positive impact of banking sector reforms in creation of competition among banks. Examining the effect of external debt on economic growth of Sudan by measuring economic growth as a function of the ratio of external debt to exports, exchange rate and foreign direct investments as the explanatory variables using annual time series for the period 1969-2015. Analyzing the relationship between capital expenditure, income inequality, total population and economic growth in 38 districts/cities in East Java Province, Indonesia during the period of 2011-2015. Investigating the upshot of money supply on inflation in Nigeria using annual time series data spanning from 1970 to 2016. Underlying an assessment of the relationship between the development factors of an Islamic financial system, and the identification and analysis of the mediating role of banking assets and equity funds for financial development. And using moral and ethical context of money and monetary policy in the creation of a stable and real growth perspective of the economy and wellbeing criterion. In this present issue of the Journal of Economic Cooperation and Development – June 2018, I am proud to present you with four articles selected based on the four-fold themes: Disaster impact on economic development; Finance impact on economic growth, Target marketing and Fiscal Sustainability. I am also honored to share the valuable information in these articles with scholars in the OIC Member countries and the rest of the world to provide them with a chance to keep up with the pace of the changes occurring in the world economy. Therefore, in this issue, the articles accord a detailed analysis of the themes related to the impact of natural disasters on economies which accentuates the need for APEC countries to rebalance its socio-economic variables of government more toward domestic and regional demand; examine thoroughly the point that the roles of finance on economic growth accentuate the function of internal and external finance upon firms’ growth and their economic integration; also emphasize the idea that, in order to target a market and achieve a decent level of a competitive edge, a need of product diversification and innovation is required; and finally, stress the point that fiscal sustainability and commitment to a long term fiscal discipline indicate a positive long-run response. Finally, I am pleased to inform the readers that SESRIC, in collaboration with its partners, will organize an International Symposium on "Financing for Development", under the theme "Thinking Innovative Solutions to Persist Development Challenges". The Symposium will be held for two days on 22-23 November 2018, in Istanbul Turkey. The Symposium will be attended by academicians, practitioners, public officials and policy-makers and will provide a platform for dialogues and discussion to address problems related to financing for development in OIC countries. A special session will be allocated to academicians to share the outcomes and policy recommendations of their research during the Symposium. The authors of high-quality papers will be invited to present their research during the Symposium which will be attended by academicians, practitioners, public officials and policy-makers and will provide a platform for dialogues and discussion to address problems related to financing for development in OIC countries. Authors of high-quality papers will be invited to present their research during the Symposium and a selection of the papers will be made. The detailed information regarding the Symposium is available through: http://www.sesric.org/activities-announcements-detail.php?id=441. Needless to say, any papers submitted both individually and collaboratively, will be much appreciated and add benefit to the progress and success of the journal.